Developing and honing your own style is one of the hardest skills when it comes to writing well. Unless you're like me and absolutely love writing essays, it's unlikely that you may have the time to practise before having to publish something or handing it in for grading. Recently, Academic Help got in touch with the opportunity to test out their writing services, to get a taste of how I could improve my skills. My writing style has developed gradually whilst having to adapt to a number of different tasks. 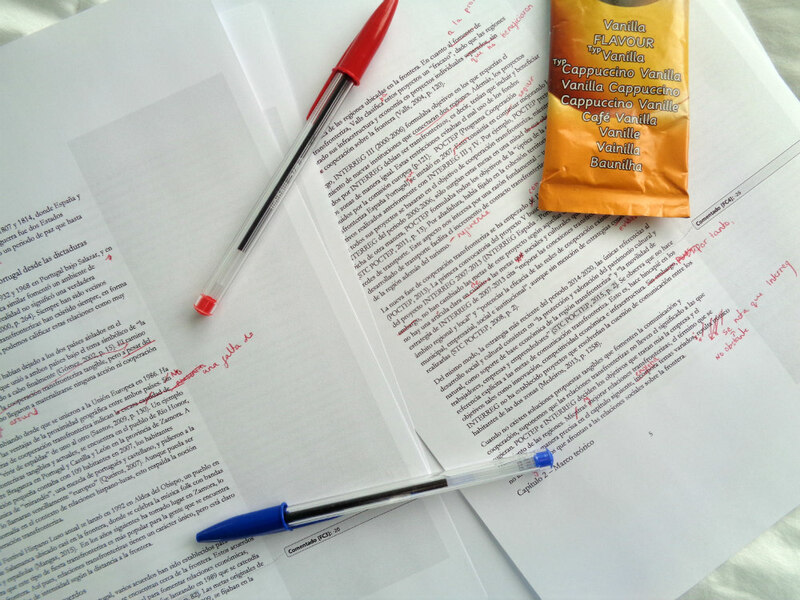 In university, academic essays require formal language, with few filler words, a well laid-out structure and a deep level of research and understanding of the topic. However when I write blog posts, whilst structure is undoubtedly still important, the language is much more relaxed with a chatty tone in order to appeal to a more universal audience. When I have articles published online (see my work so far here), the style and tone of this changes ever so slightly; they require a more informative approach without boring the reader with over complicated language. My point is that a well-developed writing style allows you to be able to apply your tone and style to any task required, which proves extremely valuable in the future, especially if you're aiming to get into writing. With free guides and how tos on particular writing styles, Academic Help is a fabulous resource for getting to grips with a type of task you may not have tried before, ranging from personal statements to memoirs to business proposals! The lovely people at Academic Help also let me trial their Essay Analysis and Grading services. The process is quite simple - sign up for an account on the website and you pay as much as you would like (it's in dollars so cheaper for you) through PayPal. Your submitted piece of work is assigned by a verified teacher, called an "expert", who will give you feedback and a grading within 24 hours. The service charges $2.50 per page, or approximately 400 words. 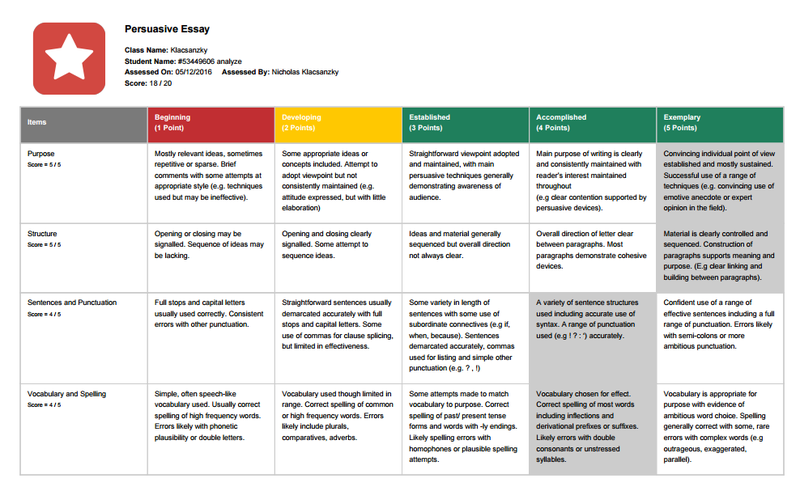 When submitting your piece to be graded, you specify what type of piece it is, within the type of discipline or topic. You are then assigned a personal expert to read through your piece and grade it. To test out the service I decided to submit the introduction of my best marked essay from second year. To give context, I received a 1st for this piece of work, so I was interested to see how the marker would evaluate my writing style. My essay was entitled "Is Turkey the permanent "other" in the context of the EU?". Here you can see the feedback I received for my introduction. American and British grammar and punctuation differences aside, the marker's feedback was pretty specific which is what I look for when having feedback. 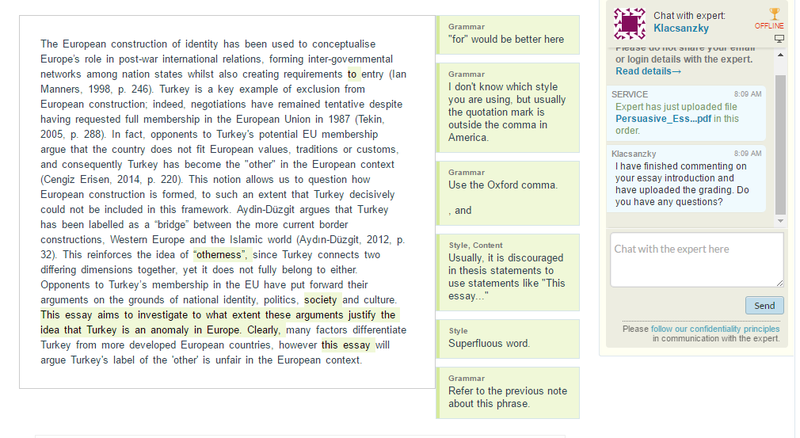 The comment bubbles are very clear and show exactly what elements to writing style the marker is referring to. This would be particularly useful if you have a few broad issues when writing and may feel a little clueless knowing where to begin. As well as specific commentary, you are attached a grade for your piece. This is more specific in terms of how each aspect of your writing would be marked. These kinds of guidelines are always useful when going through your own piece of work, especially since it's hard to critically analyse your writing without evaluating it with criteria you would want it to fit into. I was chuffed to see I received an 18/20 overall! This also corresponds to the actual mark I obtained for my essay. I lost two marks for problems with punctuation and vocabulary, but I was happy to see that my structure and argument gave me full marks. I also think this service is a great resource for bloggers. I see frequently in chats that some people struggle to naturally write well and often wish for a bit of help to fine-tune their posts. Even if you don't want to have your writing graded, the website has so many useful resources to help set out your posts, such as how to write your introduction and conclusion, and many other guides in the Writing Process section. Whilst I would suggest that the layout of the website could be a little easier to navigate (it took me a while to find the analysing and grading services), this website is a fantastic idea for anyone who is looking to improve their writing skills. Thanks for reading! How have you developed your writing skills? *This is a sponsored post. I was paid $10 credit into my account in order to trial the Analyse and Grading Services. However, all opinions are my own. For more information, visit my Disclaimer. Very well written essay. I am also looking for help online because my law exam is around the corner and I am not very good at writing good ones. My teachers have told me to Practice LSAT Questions and essays in order to reap out good results.